Tri Truck Centre | WHY HINO? PEACE OF MIND IS AS EASY AS 1-3-5. HINOWATCH Keeps your business moving 24/7/365. 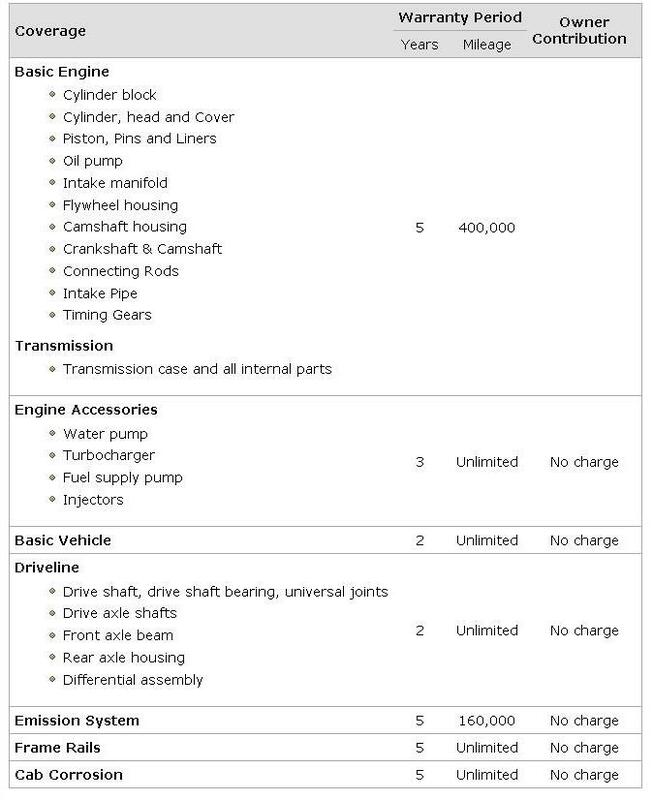 FREE 5 year/400,000 km engine and transmission warranty. 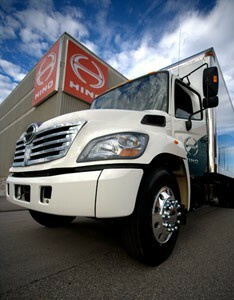 The HINO brand represents the Toyota Group in the global market for heavy-duty trucks and buses. Hino has adopted the Toyota Production System to achieve continuing gains in productivity and quality. Applying the production system to our model line allows us to offer customers the best possible products at competitive prices. BUILT BY CANADIANS. FOR CANADIANS. All Hino trucks sold in Canada are now built in a new state-of-the-art facility in Woodstock, Ontario. The local assembly plant allows us to both shorten delivery time and reduce distribution costs – resulting in savings passed on to you as our customer. EVEN BETTER STANDARD FEATURES IN 2019. HIGH QUALITY NAME BRAND COMPONENTS. Hino’s high-assistance level power steering system, combined with a Meritor front axle that is designed for Hino, provides a very fast and light steering response and is ideal for maneuvering in narrow streets and tight parking lots. Hino uses the innovative Denso electronic fuel injection system on all models, which provides pilot and multiple shot injection capability, with higher fuel injection pressures to increase fuel economy, responsiveness, and improve control over fuel delivery. 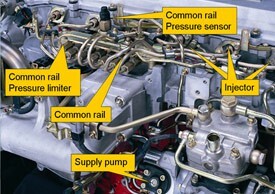 A computer maintains optimum combustion, by electronically controlling injection pressure, injection amount, and injection timing. This fuel system allows for high fuel injection pressures, even at lower engine speeds. The maximum pressure is now increased to 20,300 PSI which also results in reduced emissions. 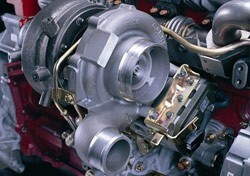 A Variable Nozzle Turbocharger is standard on all Hino models. This turbocharger uses a variable nozzle mechanism that controls the optimum air volume in response to engine speed and load, and virtually eliminates turbo lag. The opening angle of the nozzle is perfectly controlled by the engine ECU. This technology improves engine output, fuel consumption, and also reduces exhaust gas emissions. HIGH VISIBILITY AND HEAD ROOM. 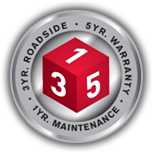 Hino recognizes the importance of visibility. The superb visibility of our new trucks is achieved through a combination of factors. 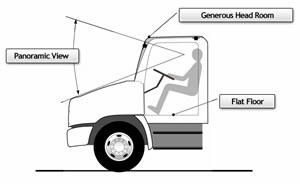 The windshield area is large, and the A-pillars are well positioned. The seating position is excellent, and the hood, which drops away sharply, doesn’t obstruct the driver’s vision.